Scheduling, which includes start and end dates as well as whether the course is self-paced or instructor-paced, changes with every course run. For courses on edx.org, you enter this information in Publisher. For more information, see Create a Course Run. For courses on Edge, you enter this information in Studio. For more information, see Creating a Course About Page in Studio. The start and end dates you set for your course are important for prospective and current learners. Current learners see your course start or end date on their dashboards. You should consider your course dates carefully. The course start date and time specify when learners can access published course content. By default, the course start date and time are set to 01/01/2030 at 00:00 UTC to ensure that your course does not start before you intend it to. The following guidelines can help you determine a course start date. Start on a Tuesday, Wednesday, or Thursday. Specify a month, day, and year. If you are unsure of the exact date, specify a day that is close to the estimated start date. For example, if your course will start near the end of March, specify March 31. Set the start time of your course early in the day, generally 00:00 Coordinated Universal Time (UTC) or earlier. Learners often expect the course to be available on the start date in their own time zones and try to access course content during the day. If you do not specify a start time for your course, the course starts at 00:00 UTC. Although learners cannot access any part of your course before the course start date, course team members who are enrolled in the course and who have the staff, admin, or beta tester role can see published content in the course before the course start date. For information about testing your course content before the course start date, see Beta Testing a Course. The course end date and time specify when learners can no longer earn credit toward certificates. Learners can continue to complete available coursework, but cannot earn credit after the course ends. Learners who have earned certificates can view the certificates soon after the course end date. In self-paced courses, course teams can make certain course components unavailable based on the course end date. For example, course teams can make a final exam unavailable after the end date for a self-paced course. For more details, see Hide a Subsection Based on Date. 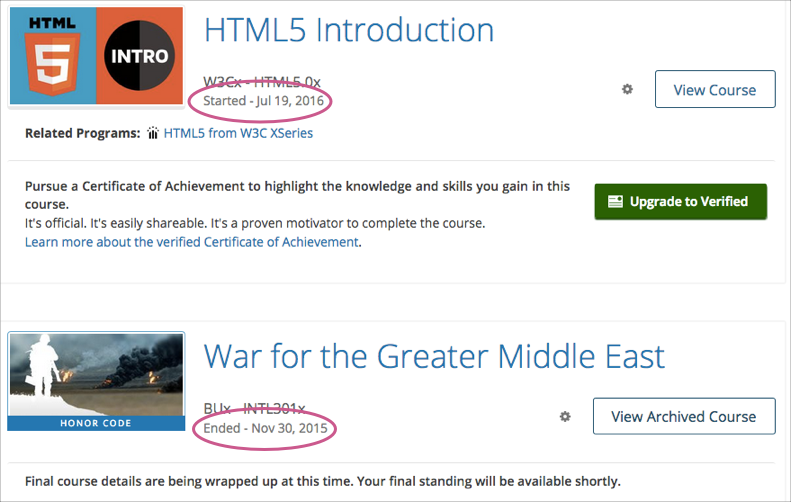 When learners browse courses, the start date for each course is visible in the course catalog and in the course’s About page. After learners enroll in courses, the courses appear on their course dashboards. To access the dashboard, learners select their usernames and then select Dashboard. For a course that is in progress or has not yet started, the start date is visible. For a course that has ended, the course end date is visible. This topic describes the difference between instructor-paced and self-paced courses. When you create an edX course, you can set the schedule of the course, including due dates for assignments or exams, or you can allow learners to work at their own pace. Courses that follow a schedule that you set are known as instructor- paced courses. Courses that allow learners to submit assignments at any time before the course ends, without internal due dates, are known as self- paced courses. In self-paced courses, learners can access all course materials when the course begins, and assignments do not have due dates. You do not have the option to set release dates for course content or due dates for assignments. The LMS shows indicators for graded assignments but no due dates. Learners can complete course material at any time before the course end date. If you set due dates for assignments or exams in an instructor-led course and later change the course to be self-paced, Studio stores the due dates that you previously set. If you change the course back to instructor- paced later, Studio restores the due dates. For more information about the way learners experience instructor-paced and self-paced courses, see Differences Between Instructor- and Self-Paced Courses in the edX Learner’s Guide.